After nearly two years of careful planning and building, the construction of SABIS®’s new corporate headquarters in Adma, Lebanon, was recently completed. The state-of-the-art, multi-story structure is now in operation and accommodating all SABIS® Educational Services personnel. 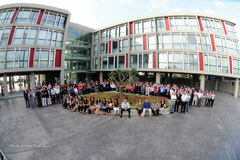 To celebrate the new headquarters’ establishment, an inauguration ceremony and reception was held on October 14, 2011. The event gathered more than 200 SES employees, SABIS® board members, and supporters for a celebration that honored the organization’s success and impressive growth that led to the building of the headquarters. SABIS® Co-Founders, Mrs. Leila Saad and Mr. Ralph A. Bistany, were on hand for the inauguration festivities, during which Mrs. Saad delivered an inspiring speech and unveiled the headquarters’ name—the Ralph A. Bistany Development Center. Mr. R. Bistany expressed his deep appreciation for the honor during the reception that followed the official ribbon-cutting ceremony. The inauguration reception was held in the outdoor space on the ground floor of the facility, space which will soon house a cafeteria for SES personnel. In addition to the eatery, the Ralph A. Bistany Development Center features extensive office space, a gym, underground and outdoor parking, training and seminar rooms, and capacity for more than 380 people, providing SABIS® team members with the atmosphere and resources to fuel passionate pursuit of the SABIS® Core Purpose, plus ample room to accommodate the organization’s growth.